Rain Bird Corp. added a new controller to its ESP-LX Series: the ESP-LX Basic. 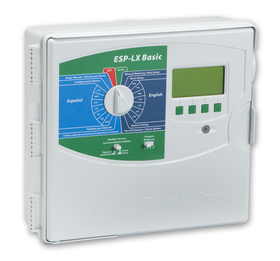 With the release of the ESP-LX Basic, Rain Bird also introduces a new technology to the irrigation industry—one that makes it possible to switch the controller’s language from English to Spanish with the turn of a dial. The ESP-LX Basic’s base model can control 12 stations and is expandable up to 48 stations by adding hot-swappable four-, eight- and 12-station modules. An external alarm light and on-screen messaging notifies users of conditions that could disrupt controller operation. Users can create four individual watering programs with eight available start times per program. A SimulStations option allows two stations to operate at the same time. The Cycle+Soak divides total irrigation time into shorter cycles, preventing run-off and allowing water to soak into plant and turf root zones. The controller also has a Seasonal Adjust from 0 to 300 percent. The ESP-LX Basic also can be outfitted with a weather sensor. “We understand that one size doesn’t necessarily fit all when it comes to commercial irrigation control,” Azad said. “By adding the ESP-LX Basic to our ESP-LX Series of commercial controllers, we can now provide contractors and maintenance professionals with a wider range of choices to better match their unique needs.